Best 2 Post Car Lift - Do NOT Buy Before Reading This! - Top Review Zone! Best 2 Post Car Lift – Do NOT Buy Before Reading This! For the minimal repairs of your own car, you won’t need to go to any mechanic. If you have the minimum knowledge about issues, you can fix things in your garage by yourself. Yes, it’s simple and of low difficulties, although you may think it a giant task initially. Knowing the basic things and having a few necessary equipments are the key to do your repairs successfully. Among the required equipment, a car lift is a must one. It will help you ensure easy and safe lifting required for fixing the issues of your car. It surely minimize the risks and difficulties to be faced at the time of repairing a car. Using a car lift is not complicated at all, but obviously it’s going to be an expensive purchase. So, it’s very important to be very precise about your necessity and select that type of car lift which can meet your demand most. Among all the available options, a quality 2 post car lift from any of the reliable brands can be a great purchase for home garaging purposes. You are going to know about the best 2 post car reviews by this article. A 4 post car lift is an expensive option especially for the purpose of quick repairing and long-term storage purposes. On the other hand, a 2 post car lift is a cheaper alternative for car repairing and short-term storage. The time of car storage is mainly dependent on the type of lift you have. All of the wheels of a car are supported by a 4 post car lift, so you can store the car for a long time. You need the best suit and convenient lift if you work regularly. Without a lift it’s quite tough to work underneath the car. A car lift makes it really easier. And, if you have a two post lift, it’s more than easy. A 4 post lift can’t give that type of convenience as the post can get in the way. It makes the movement very tough and using the tools gets more awkward. Whatever it is needs to be sturdy. A sturdy drive on ramp makes it much easier to set the car up and position on the lift. One irritating thing with the 2 post car is the height of the car lift posts. The post can’t get under the car if the car is lowered. On the other hand, a 4 post lift has a pretty low ground clearance. That’s why a low car can easily get into it. But, some of the latest 2 post car lifts have brought a solution to this problem. You can check out those. A 4 post lift is generally bigger than the 2 post one. Due to the size, many of the users like to have a smaller one that fits their garage. So, 2 post is a good option in this regard. However, few of the 4 post lifts are portable nowadays. But, a 4 post car lift is obviously stable than a 2 post, which is a great reason for its popularity. At the end, considering all the factors our suggestion is to pick a high quality 2 post car lift instead of a 4 post lift. The NT-9 is a budget-friendly 2 post floor car lift with an ability to lift cars over/around 4 tons. It has a great user satisfaction history. It’s capable of accommodating nearly all vehicles of standard width. Let’s know in-depth about everything of Triumph NT-9. We said as a consideration that you should purchase an all-steel car lift even if costs more than the partially plastic made option. It’s sturdy, durable, and able to provide better service. The NT-9 is an all-steel construction car lift. Without bending the columns or developing fractures, Ii capable of lifting the maximum car weight. It has a 220 power voltage motor that is able to lift up any vehicle up to 4 tons (9000lbs) to the maximum height in 40 seconds only. To be noted, the weight is usually the curb weight. You can use the lift outside of your garage; but don’t forget to cover the motor before use. And, continuous lubrication is essential to prevent the parts from being seized due to corrosion. The 9000lbs weight limit offers brilliant compatibility for most of the vehicles on the roads. 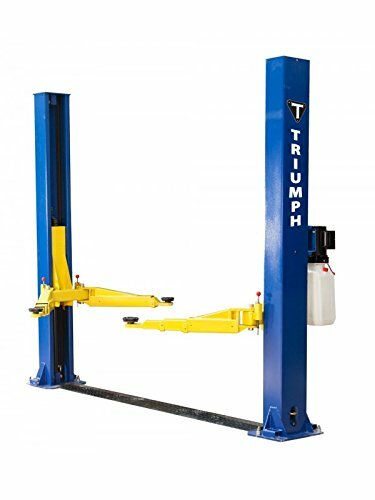 The Triumph NT-9 is capable of lifting the compact cars, mid-size cars, large cars, sports utility vehicles (SUV), compact trucks, mid-size trucks, and large trucks. It features a safe floor plate for routing the hydraulic hoses and equalization cables to the dependent column from the smart column. The hydraulic unit of the lift is fitted on the smart column which is also said as upright column. The hydraulic unit is made up of a hydraulic pump, a single-phase electric motor, plastic hydraulic fluid reservoir, and a dump-valve handle. Before the hydraulic fluid reaches to another column, it initially goes through the hydraulic cylinder. That other column is known as the dependent column. You can mount the plate into your garage with the help of floor-mounting hardware. The Triumph NT-9 can lift 72 inches maximum. A hydraulic mechanism maintained by the hydraulic unit of the machine (described above) is used to lift the car. You should keep it in your knowledge that not the wheels only the chassis is lifted. It means- the lifted height is the body height of the vehicle. The height from the chassis underside to the luggage rack top is considered as body height, which includes the height of the wheels, therefore. Lower price compared to most of the identical lifts. Space saving and reliable symmetrical design. 72 inches ample height lifting. Nearly all personal and commercial vehicles can be lifted. Car height can be lifted beyond the column top. Insufficient instruction to use the lift. Requires at least 4 inches concrete slap. The MaxJax is capable of lifting up to a 6000 lbs. (2.7 tons) curb weight with the help of a compact hydraulic unit run by a powerful motor. So far we inspected, it has really excellent portability around the workspace (especially your garage); it doesn’t matter if space is not wider to do other related work. Moreover, the lift is just the right size to fit indoors without giving you problems with the ceiling. It features two upright columns. A set of wheel kits is attached at the base of the columns, and there is no floor plate. That means the hydraulic hoses of this machine need to be routed directly onto each vertical column from the hydraulic pump. The MaxJax neither has a smart column nor a dependent column like the Triumph NT-9. With the sturdy and compact structure, the Dannmar MaxJax is capable of lifting the compact cars, mid-size cars, large cars, sports utility vehicles (SUV), compact trucks, and mid-size trucks. But, obviously it should not be something that is weighter than 6000 lbs. The maximum height of lifting a car by this unit is 45 inches. You can increase it up to 48 inches with the help of a lift adapter, nothing more than that. But, the portability is more than brilliant. 45 inches ample lift height. Car height can be lifted more than the top of the column. Fully safe operation requires a little bit expertise. The hydraulic cylinders may develop leakage by time. As said earlier, purchasing a post car lift is an expensive investment, so it’s obviously necessary to do full research before spending your hard-earned money on any of these available in the market. This is going to be an investment that is meant to be used for long-time. So, the important and unavoidable factors must be considered wisely. Let’s know some of the things that will surely help you. The main thing to consider before you purchase is your necessities. For instance, you need to fix the maximum weight you want to lift. Never purchase a car lift according to your average weight lifting possibility. If you do that, it might go in vein when necessary. A miscalculation on weightlifting possibility and capability might be a serious threat to your safety at work. Another thing to be considered is the dimensions of the range of your vehicles you are planning to be lifted. How closely the vehicle turns to the ground is a key point, therefore. We are discussing 2 post car lift reviews in this article. But, before you to purchase it be clear that it’s the best choice for your purposes. It may happen after purchasing a 2 post lift you start to feel for a 4 post. If you want to raise your vehicle only for repairs, go for a 2 post on that case; otherwise, 4 post can be a better option. While deciding the weight lifting capacity and 2 or 4 post configuration, think about the physical dimensions of the lifts. You must not buy a lift which is not fit for your garage. There must be sufficient space inside your garage so that you can install the lift and work smoothly as your home workshop later. You must not forget the limitation that your home garage workshop is much smaller than a professional workshop. For your hygiene and safety issues you should ensure that there is a 2-feet clearance around the construction of your lift. You also need to ensure the fact that your garage has enough space for installing the lift beyond ensuring the space for the lift to be fit as stated in the previous paragraph. The ground material is another matter here. It should be a concrete base with a thickness of 6-inch at least. Don’t forget, the retaining bolts will require to be screwed in. If your garage doesn’t have a suitable structure, then it’s required to be built by any local building contractor. Car lifting is a heavy task that requires a sturdy and durable lift. So, obviously go for an all-steel lift even if it costs a bit more. When you check the lifts while purchasing or before purchasing, you can see that some of them are made of plastic inside the legs, although the outer part of the legs are made of steel. This is mainly done to minimize the cost compared to an all-steel lift. But, this type of plastic made lift might be unable to lift the weight for longer period and even be unable to hold up the wear & tear usually happens at the time of lifting. If you purchase one of these, you might need a quicker replacement, which is totally a waste of money. So, do not compromise in this matter. To lift the car from base, the plates of the lift can be bent on the shaft. But, this is obviously not that much strong and durable as the actual weld. If the plate is bent on the shat only, it might be sag by the weight of your car. So, you should purchase a lift with actually welded plates to shaft. It guarantees ultimate strength and durability. Don’t forget to check out this feature in your purchasing lift. If you want a lift that can perform very fast you can get it. As for example, a lift can rise in 75 seconds only, while another may take 2 minutes to do that. It totally depends on kind of free standing. So, get what you are preferring according to your needs. You can search every possible opportunity in a car lift you are going to purchase. But, if you can’t afford that one with full of good features, then you should obviously stop thinking of it and restart your search for another one, which will be the best match between lift quality and your budget. This is not very tough; if you continue to research, you will surely understand which one is worthy for you. Last but not least, you need to check the issues of warranties. Every machine is susceptible to both unexpected failures and human errors. For a warranty issue, you can’t claim it in case of human-failures. But, for any kind of unexpected failures, you have every right to claim the service under warranty if the product is provided with a warranty period. A good and/or brand manufacturer always provide a certain warranty period that covers any kind of unexpected failures. While buying check the time period of warranty of your lift. And, justify the comprehensiveness of the warranty. Be clear about the type of after-sales service also. 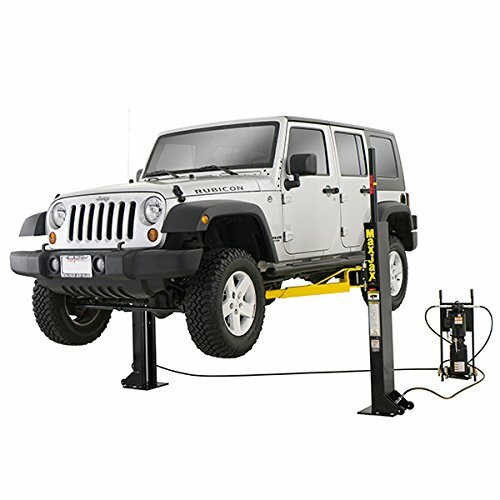 To have one of the best car lifts for home garage is an all-around solution if you have a car. You obviously want something that can make all of your car repairing and maintaining tasks easier. What will make the lifting nothing but a matter of command is always preferable while repairing your car? That’s what we tried to focus through this article. This comprehensive guideline along with the two best 2 post car lift reviews will help you at its best, we believe.